A team of US researchers has developed a new technology that can safely and precisely drive robot arms, giving them the delicacy necessary to pick up an egg without breaking it. The new hydrostatic transmission combines hydraulic and pneumatic lines. This transmission has almost no friction or play, offering extreme precision for tasks such as threading a sewing needle. “The hybrid transmission makes it possible to halve the number of bulky hydraulic lines that a fully hydraulic system would require. Robotic limbs can now be made lighter and smaller,” said John P Whitney, assistant professor of mechanical and industrial engineering at Northeastern University. A robot joint normally would have two hydraulic cylinders, balanced against each other. But in this latest design, the researchers paired each water-filled cylinder with an air-filled cylinder instead. The pneumatic cylinder serves as a constant force air-spring, providing the necessary preload force, allowing the joint to move in both directions with only half the number of bulky hydraulic lines. “The transmission provides our robot with incredibly smooth and fast motion, while allowing life-like interaction with people and the handling of delicate objects,” added co-author Jessica Hodgins, vice president at Disney Research and professor of robotics at Carnegie Mellon University. “For now, the robot is remotely controlled by a human operator, but we would expect the same level of mechanical performance once the motions are automated,” she added. The researchers used the new transmission to build a simple humanoid robot with two arms, with stereo cameras mounted in the head, streaming their video signal to an operator wearing a head-mounted display. 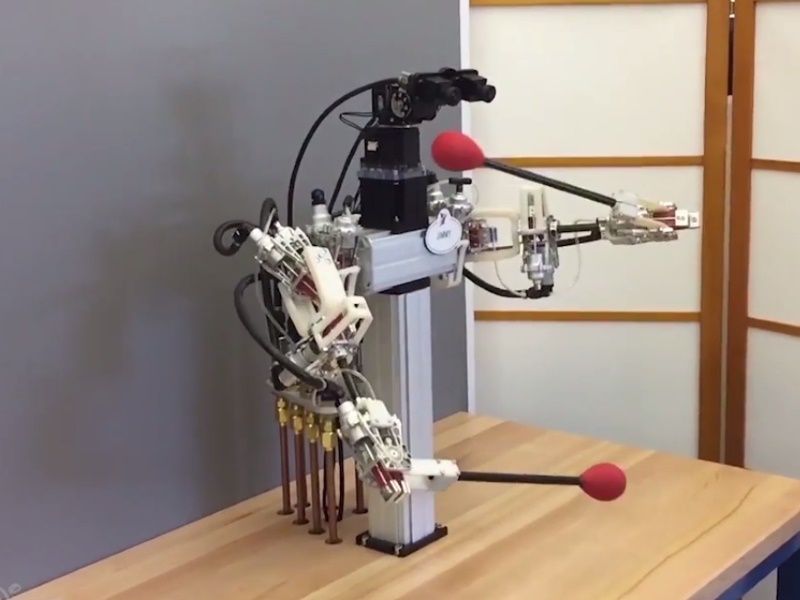 The arms are coupled to an identical control figure, hidden behind a wall to enable the robot to be used for human-robot interaction research. “This technology enabled us to build robot arms that are light, fast, and dexterous,” Whitney noted. They have an incredible life-like nature, offering a combination of small mass, high speed, and precise motion not seen before. Robots using this technology are ideally suited for naturally compliant and life-like interaction with people. The team will report on the new technology at the “IEEE Conference on Robotics and Automation (ICRA) 2016” in Stockholm, Sweden, on May 17. No Comments on "New Robot Features Human-Like Precision"